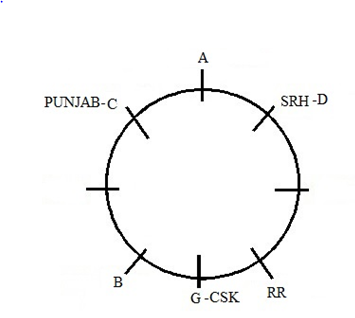 There were eight friends A, B, C, D, E, F, G and H sitting in a circular table at equidistant. 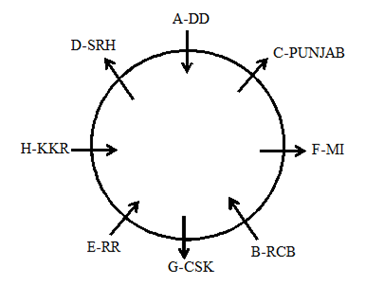 All of them like different IPL teams CSK, RCB, RR, MI, DD, Punjab, KKR and SRH but not necessarily in the same order. 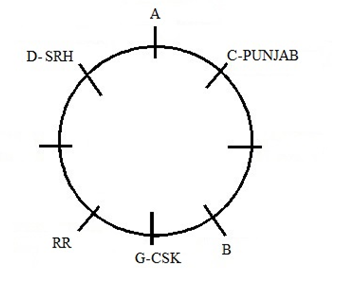 Four of the friends were facing the centre while the other four friends facing outside the centre.No two successive friends sit together according to the alphabetical order. There were two days gap between C and the one who likes CSK. The one who likes KKR sits second to the right of G. E faces the centre. There were two friends sits between G and the one who likes SRH. The immediate neighbour of E faces the opposite direction. B does not like SRH. The one who likes KKR sits second to the right of the one who likes DD. C does not like RR. D sits second to the left of the one who likes Punjab. A sits opposite to the one who likes CSK. The one who likes RCB sits second to the right of E. F sits opposite to the one who likes KKR. The one who likes RR sits second to the left of B. 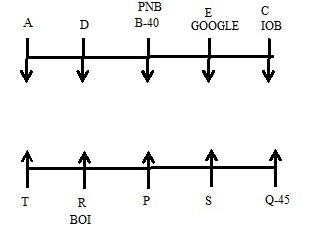 The immediate neighbour of B faces the same direction. C sits second to the right of the one who likes SRH. The one who likes Punjab sits opposite to the one who likes RR. 1. Who among the following likes CSK? There were two friends sits between G and the one who likes SRH. C sits second to the right of the one who likes SRH. There were two days gap between C and the one who likes CSK. A sits opposite to the one who likes CSK. The one who likes RR sits second to the left of B. 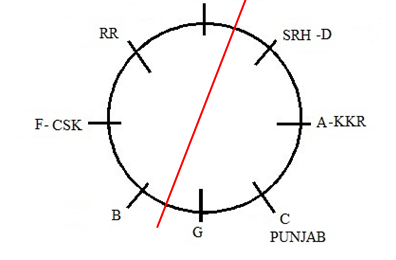 The one who likes Punjab sits opposite to the one who likes RR.D sits second to the left of the one who likes Punjab.B does not like SRH.C does not like RR. The one who likes KKR sits second to the right of G.F sits opposite to the one who likes KKR. 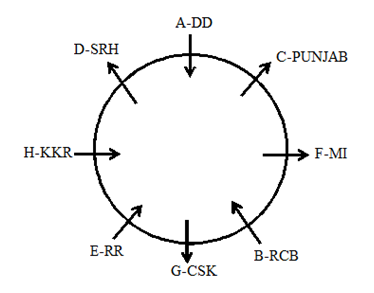 E faces the centre.The one who likes RCB sits second to the right of E. F sits opposite to the one who likes KKR. The one who likes KKR sits second to the right of the one who likes DD. 2. 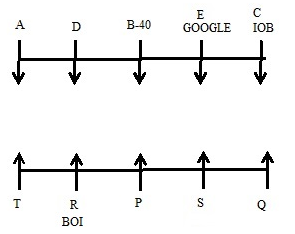 What is the position of E with respect to the one who likes DD? 4. 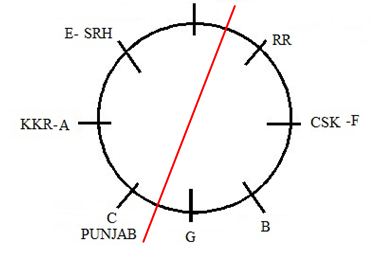 If G is related to DD and H is related to MI then in the same way C is related to? 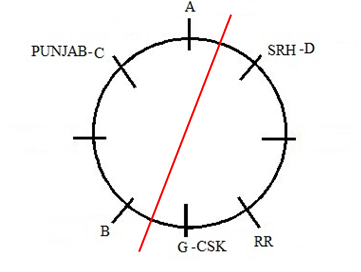 How many persons are there between H and the one who likes RCB when counted from clockwise direction? Ten persons are sitting in two parallel rows containing five persons in each. 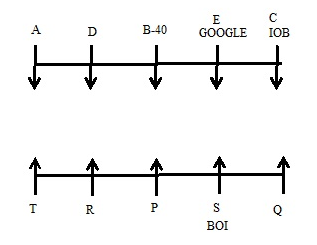 In row 1, A, B, C, D and E are sitting and all of them are facing south. In row 2, P, Q, R, S and T are sitting and all of them are facing north. In the given seating arrangement, each member seated in a row faces another member of the other row but not necessarily in the same order. 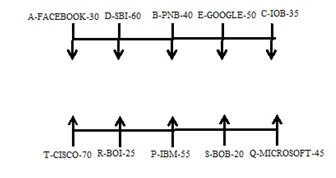 All of them works in different organisations Google, Facebook, Microsoft, BOB, SBI, PNB, IBM, BOI, IOB and Cisco but not necessarily in the same order. Each of them has different salaries 20k, 25k, 30k, 35k, 40k, 45k, 50k, 55k, 60k and 70k but not necessarily in the same order. No two successive friends sit together according to the alphabetical order. There were two persons sit between Google and A. The one who works in Google faces the one who sits to the immediate right of P. There is a gap of one day between R and the one whose salary is 20k. The one who works in Microsoft sits opposite to the one whose salary is 35k. E faces the one who sits second to the right of R. There is a gap of one day between A and the one whose salary is 40k. There were two days gap between D and the one who works in IOB. There were two days gap between the one whose salary is 45k and the one who works in BOI. The salary of A is half of the salary of the one who works in SBI. P’s salary is 55k. There were two days gap between the one whose salary is 70k and the one who works in BOB. P sits second to the left of the one, who faces the one who works in IOB. The one who works in Facebook faces south. The immediate neighbour of 40k faces the one who works in BOI. The one who works in PNB faces the one who sits second to the left of the one whose salary is 45k. The one who works in Facebook sits opposite to the one whose salary is 70k. There is a gap of one day between the one who works in PNB and the one whose salary is 35k. The one whose salary is 20k faces the one whose salary is 50k. D does not sit at any of the ends. The one who works in Facebook faces the one who sits second to the left of the one who works in IBM. 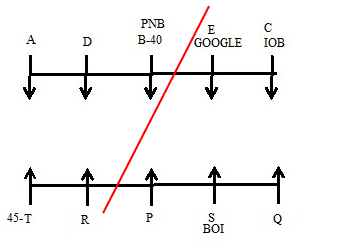 There were two days gap between D and the one who works in IOB.D does not sit at any of the ends.P sits second to the left of the one, who faces the one who works in IOB.There were two person sits between Google and A. 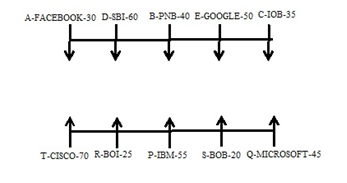 The one who works in Google faces the one who sits to the immediate right of P.E faces the one who sits second to the right of R.There is a gap of one day between A and the one whose salary is 40k.The immediate neighbour of 40k faces the one who works in BOI. There were two days gap between the one whose salary is 45k and the one who works in BOI.The one who works in PNB faces the one who sits second to the left of the one whose salary is 45k. 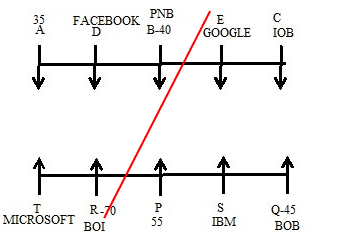 The one who works in Facebook faces south.The one who works in Facebook sits opposite to the one whose salary is 70k.The one who works in Facebook faces the one who sits second to the left of the one who works in IBM. There were two days gap between the one whose salary is 70k and the one who works in BOB.The one who works in Microsoft sits opposite to the one whose salary is 35k.The salary of A is half of the salary of the one who works in SBI. P’s salary is 55k.There is a gap of one day between R and the one whose salary is 20k.The one whose salary is 20k faces the one whose salary is 50k. 7. What is the salary of the one who works in BOI? 9. Which of the following combination is true? 10. Who were the immediate neighbours of the one who works in PNB? Q1. Who among the following likes CSK? Q2. What is the position of E with respect to the one who likes DD? Q3. Four of the following were in a certain group, which of the following that does not belong to that group? Q4. 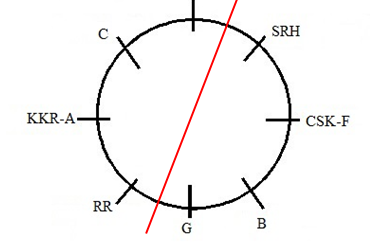 If G is related to DD and H is related to MI then in the same way C is related to? Q5. 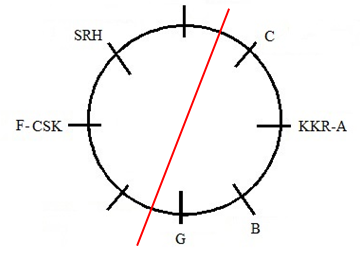 How many persons are there between H and the one who likes RCB when counted from clockwise direction? Q7. What is the salary of the one who works in BOI? Q9. Which of the following combination is true? Q10. Who were the immediate neighbours of the one who works in PNB?